Adult women who have arrived at mid-life may begin to experience specific gynecological healthcare concerns that are directly related to this stage of life. Our gynecologists and entire staff are sympathetic to women at this stage of life and are readily available to help them with their healthcare needs. In situations where excessive menstrual flow from the uterus becomes excessive and becomes a serious problem, a procedure called endometrial ablation can be performed to reduce or end the blood flow. There are methods of endometrial ablation that can be performed at Rosemark while others may require hospitalization. There are many factors that affect the hormone balance in a women’s body as they mature and progress through menopause. As women age, the chance of significant imbalance increases resulting in a variety of menopausal symptoms including hot flashes, night sweats, PMS, fatigue, depression and low libido to name a few. There are effective treatments available to balance hormones and significantly improve quality of life. When a woman does not want to become pregnant, permanent sterilization is a method of birth control. There are a few methods of permanent sterilization which the Rosemark surgeons perform including those that are non-invasive and can be completed at our office without hospitalization. While many women are embarrassed or self-conscious about their sexual health, sexual dysfunction among middle-aged women is a common problem and one that can be addressed with the Rosemark gynecologists. When considering one’s sexual health, it is important to recognize that most of the dysfunctions are common and treatable. 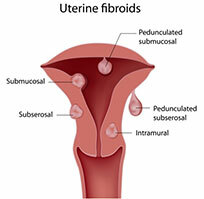 As many as 75% of women will have uterine fibroids in their lifetime. 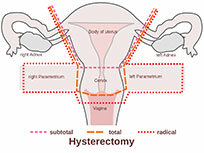 Uterine fibroids are non-cancerous growths on the uterus. The fibroids may increase and decrease in size in varying rates. Uterine fibroids can cause heavy menstrual bleeding, prolonged menstrual periods, pelvic pain and frequent urination. There are several treatment options to treat this condition.